The word museum conjures images of ancient artefacts, silence and yawning. High Tea at the Museum of Sydney Café however does not. The first thing you notice about the café are the patterned tea cups on each table and you know you're in for a treat. The café is cosy, comfortable and professionally run without being pompous. The atmosphere is relaxed and you can easily have a chat with friends without being worried about your subject matter, a stray hair or that your legs aren't crossed at the correct angle. 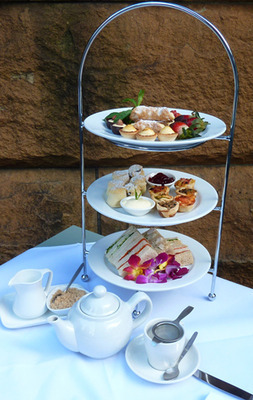 The High Tea platter is three tiers of intrigue. The bottom layer boasts traditional cucumber, chicken, egg and salmon sandwiches and the middle a delightful selection of mini quiches and baby scones with the appropriate condiments, jam and cream of course. The top layer is pure indulgence with chocolate dipped strawberries, a selection of tarts and the all important cannolis. Check out the menu here. It wouldn't be a High Tea without a pot of the good stuff and I'm not talking a teeny tiny silver pot either. To wash it all down you receive a large ceramic teapot which is filled with your choice of tea – all T2, from Turkish Apple to the traditional English Breakfast. You can also choose a package with a class of wine or champagne instead. The level of indulgence is up to you. The High Tea tradition originated in the mid 1700s and was initially eaten standing up by the everyday working man – hence 'high'. Gradually this idea has evolved into a popular social event for all to enjoy. So now that you've had your dose of history you can skip the museum and go straight for the sweets! Why? Located in the heart of the city, it’s a treat everybody deserves.